Simon & Garfunkel never saw this coming. In 1969, Paul Simon stepped away from his characteristically intricate storytelling to write a song called Baby Driver, about an elusive young man out to sow his oats at dizzying speed. It's catchy and has a delicious hook, but, from this point on, it should primarily be remembered as the song that gave Edgar Wright's new film a perfect name. If there is one film to watch on the big screen this year, it is the timeless and turbocharged Baby Driver. Conversely, there can be no better film to watch on a smaller screen you own, with the cars cradled in your hands, with the movie itself occasionally jerking left to right in inevitable echo of the on-screen chases, and with, most crucially, earphones plugged into you. There is, you see, something magical about music coursing directly into you - and only you - loud and alive and throbbing in your veins, while the world is several tracks off. This white-corded connection to a meticulously chosen groove is the lifeblood for a getaway driver called Baby, a young man who needs - in the smartly snarled words of another character - "a score for a score." He's a pretty prodigy, a child so cherubically beautiful he looks perpetually on the verge of smiling, and Wright charts his life out for us via iPods, going from classic to recent. Baby carries different ones for every flavour and circumstance, and his being constantly jukeboxed causes the world, a world ever keen to eavesdrop, to squirm with distrust. This applies even to his fellow bank-robbers. It isn't enough that Baby drives like a braggadocious video-gamer with cheatcodes scribbled on his sleeve. It isn't enough that he's flawless. It is, quite simply, that grown men with codenames like Bats and Buddy and Doc are thrown off their game because they aren't cued in. (The girl, Darling, buys into Baby's magic without question.) They're sitting beside and behind Baby as he makes tyres squeal and baffles police helicopters and gets them to safety, and their jaws naturally drop because of his sheer virtuosity - articulate kingpin Kevin Spacey refers to him as 'Mozart in a go-kart' - but they don't know what he's listening to and, thus, what page he's on. My own jaw fell less than two minutes into the film as the blindingly beautiful opening sequence, set to the saucy Bellbottoms by The Jon Spencer Blues Explosion, kicked into gear. It starts relatively innocuously, Baby lipsyncing with complete abandon as he waits for his well-heeled partners to sprint back with bags of loot, but when he steps on the pedal, by God, it's a gas. I've never seen anything quite like it. Both the visuals - Baby's automotive moves - and the ambient sounds of engine, scream, police siren, all sync up to accentuate the music, and vice versa, in a way that would make Scorsese high-five Tarantino. In cinema, you do indeed need a score for a score. Or at least we have, since Jules Dassin's audaciously silent Rififi heist in 1955. 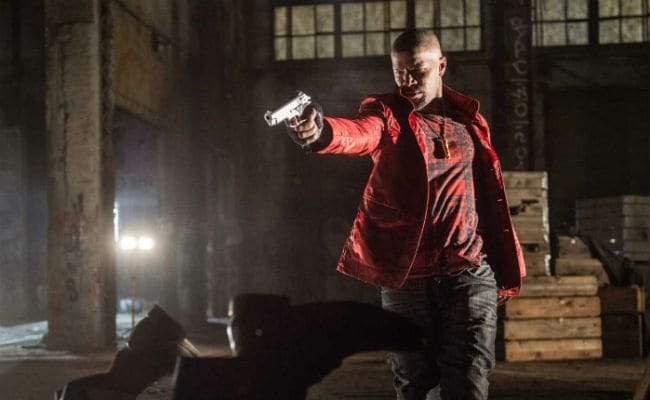 Modern chase setpieces feature music as a full-blooded character, often even the lead, and the reliance on a finely picked pop song can't be overstated. Edgar Wright, it appears from this miraculously assembled film, gets it - and gets it better than perhaps anyone before him. This is a film that reinvents, appropriates and owns songs with stunning confidence, and discards irony to embrace the joy of music. Wright's most celebrated comedies are often grouped together as The Cornetto Trilogy; Baby Driver, I daresay, is his popsicle. Ansel Elgort is Baby, a beautiful young man who pirouettes in his kitchen the same way he makes a muscle car turn 360 degrees. There's a balletic grace to his every movement - be it slathering peanut-butter onto the edges of a sandwich, switching freeway lanes at lethal speed, or miming a Dave Brubeck piano solo - and he keeps the songs playing because music, and moving to music, helps him escape. The first time we see him wilfully taking his earphones out is when a girl walks by him, mouthing a song he doesn't know, a song with his name on it. This is not merely heist film but also soft-poached noir - one last job, runaway lovers, high stakes and increasingly weird bad guys - and Wright breaks the eggs in spectacular style. 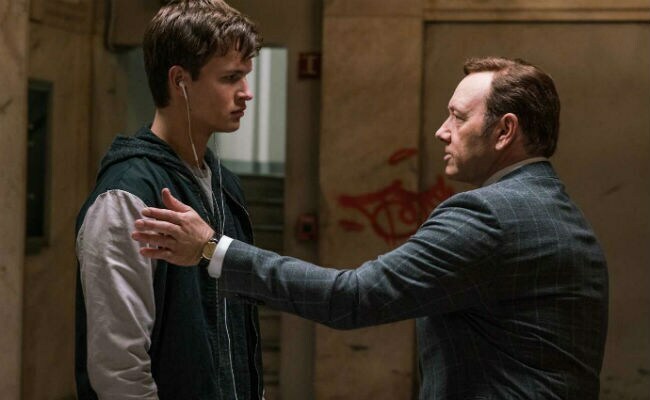 The dialogue crackles, particularly lines thrown out by Spacey, who points to a prolifically tattooed crook and says he "puts the 'Asian' in 'home invasian'," and the actors have a ball. 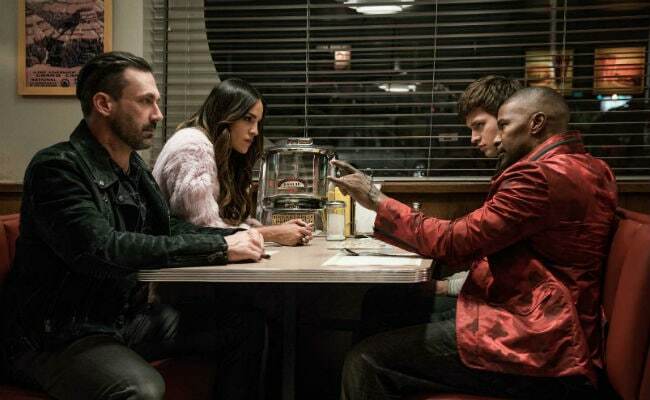 Jon Hamm takes his last name all too seriously, Jamie Foxx is dynamite as the proudly unhinged member of the crew, and Lily James is achingly winsome as Debora, the girl Baby shares music with - and thus, finally getting to talk about music, he comes to learn that T-Rex isn't pronounced "Trex." She, meanwhile, frets that she has hardly any songs named after her. There are a couple of fine musician cameos, including one of the best bassists in the world, but I suggest you discover those - along with other nifty touches, like the cars chosen for the film - at your own pace. Blink as infrequently as you can. Baby Driver is so cool it's hot. Wright's cinematic choices line up remarkably well, from the way he showily shoots Baby and Debora's date in swirling jump-cuts, to the compulsive way Baby uses songs to flee and very differently when he isn't on the run. Even Baby's name, the coolest name in all music, works maddeningly well for a driver. When a boy kisses a girl in a classic Hollywood romance, her leg goes up. This pop is due largely to balance, certainly, but it has, over the years, become a flourish, an inescapable part of the fairytale iconography. This is why Baby drives like he does, using his handbrake to spin on one wheel as if he were auditioning to be Batman's chauffeur, even when nobody might be watching - because he knows he's good enough to be iconic. It's a good thing everybody puts Baby in a corner. He sure knows how to look good getting out.